Free Shipping Included! 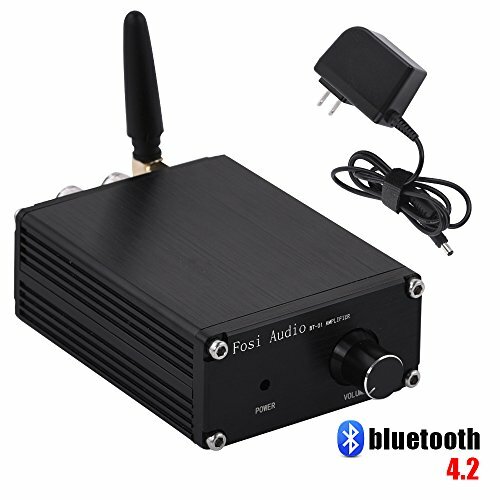 Bluetooth 4.2 2 Channel Stereo Audio Hi-Fi Amplifier Receiver Small Mini Class D Digital Wireless Amp for Home Car Speakers with Power Supply TPA3116 50Watt by Fosi Audio at The Met Theatre. MPN: BT-01. Hurry! Limited time offer. Offer valid only while supplies last. Additional Notes:Please plug the power cord into the amp THEN the wall.Parameter:1. Power supply voltage range: 12v-24v;2. Power supply: 12V 3A 36W3. Please plug the power cord into the amp THEN the wall. 10. Supplied Accessories: Amplifier, Power supply, Manual, 18-month warranty. 50W RMS X 2(4 ohms, 20 Hz - 20 kHz, 0.04% THD), Compatible with any Home/ Auto Car/ Boat/ Motorcycle audio devices.